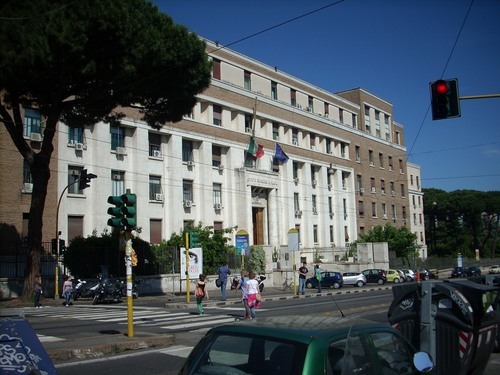 The Istituto Superiore di Sanità, the Italian national institute of health in Rome (Viale Regina Elena 299), was founded in 1934 with the financial help of the Rockefeller Foundation. "The New York Rockefeller Foundation was already financing an experimental antmalarial station in Italy, whose Director was Alberto Missiroli and where L.W.Hackett also worked as the Foundation's representative. In 1928, Alberto Missiroli convinced the Rockefeller Foundation to provide financial aid for the creation of an Italian Nattional Institute of Health. (…) The new Institute, in addition to being a 'School of Hygiene and Public Health', would 'create adequate premises equipped with the latest instruments and equipment for the scientific laboratories of the Direction General of Public Health"1. The "Istituto" still keeps its original mission and has turned into one of the leading scientific institutions in Italy. To the original building many more have been added on a large area near the Policlinico Umberto I. Moreover it houses the Museo dell’Istituto Superiore di Sanità, a modern publich-health museum that originates from the experimental museum of ISS founded in the 1940s. At least four Nobel Prizes worked for a considerable time inside this institution: Enrico Fermi, Ernst Boris Chain (from 1948 to 1961), Daniel Bovet (from 1947 to 1964) and Rita Levi-Montalcini. - C.Bedetti, P.De Castro and S.Modigliani (Atti del Convegno a cura di), Storie e memorie dell'Istituto Superiore di Sanità, Istituto Superiore di Sanità 2008, pp. 90. - Various Authors, La nostra ricerca per la salute di tutti. 1934-2004, Istituto Superiore di Sanità 2006, pp.81 . 1. V.Alberani, M.Morellini and F.Timitilli, Istituto Superiore di Sanità. Immagini nel tempo, Istituto Superiore di Sanità, Roma 1999, p. 134.